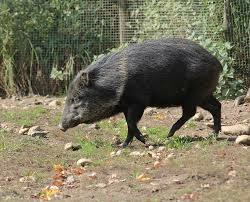 Peccaries are also called „navel-pigs“. Their hair is stubbly , their size is up to 1m with a weight up to 30kg. A light yellow stripe is running from their shoulder to the chin. With the help of a big gland they mark their territory with a strong smell. Collared Peccaries are feeding on fruit, palm-nuts, snails, small animals and leaves.